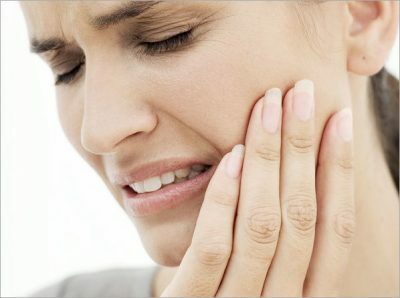 Have you ever experienced discomfort in one or several of your teeth after drinking or eating something hot or cold? Though the pain is usually brief, this sensitivity can be very uncomfortable. Sensitive teeth occur when the tooth’s enamel, or outer shell, is compromised, leaving the dentin and nerves of the tooth unprotected. There are several reasons you may have sensitive teeth. Cavities, cracked teeth, enamel loss, and gum disease are leading causes of sensitive teeth. Cavities and tooth decay erode the enamel, exposing the delicate layers, such as the dentin, underneath. Similarly, general loss of enamel, caused by over brushing or a diet high in sugary and acidic foods, can also expose the sensitive layers of the tooth. When something cold or hot reaches these areas it can be very painful. Grinding your teeth can lead to fractures and cracks in the enamel similarly leaving the tooth open to irritants. While gum disease causes the gums to pull away from your teeth, leaving the sides and roots exposed to bad bacteria that can eat away at the enamel. There are other, more extreme, reasons you might have sensitive teeth. For example, gastroesophageal reflux can cause sensitive teeth. This condition causes acid in the stomach to travel back into the mouth. The acid can damage enamel. In all matters of tooth pain, it is best to seek advice from your dentist. They can help you determine the specific cause of your discomfort. In order to treat sensitive teeth, you should consult your dentist. If serious signs of damage are already apparent, they may recommend sealants, crowns, or fillings. In addition, they will likely advise you to start using a special fluoride toothpaste, over-the-counter gentle, desensitizing toothpaste, or some other fluoride treatment. Try to avoid sensitive teeth altogether by adopting good dental hygiene practices now. Brush and floss your teeth daily or as your dentist suggests.